The iron ship 'Cape of Good Hope', 1399 tons, moored in an unidentified port [iron ship, 1493 tons, ON72417, 238.8 x 37.7 x 22.5. Built 1876 (7) J&G Thomson, Glasgow. Owners A. Lyle and Sons, registered Greenock. c.1891 sold to Danish and renamed Amy. Wrecked Staten Island, July 8 1894]. One of the ships owned by The Cape Line / A. Lyle and Sons, Greenock. 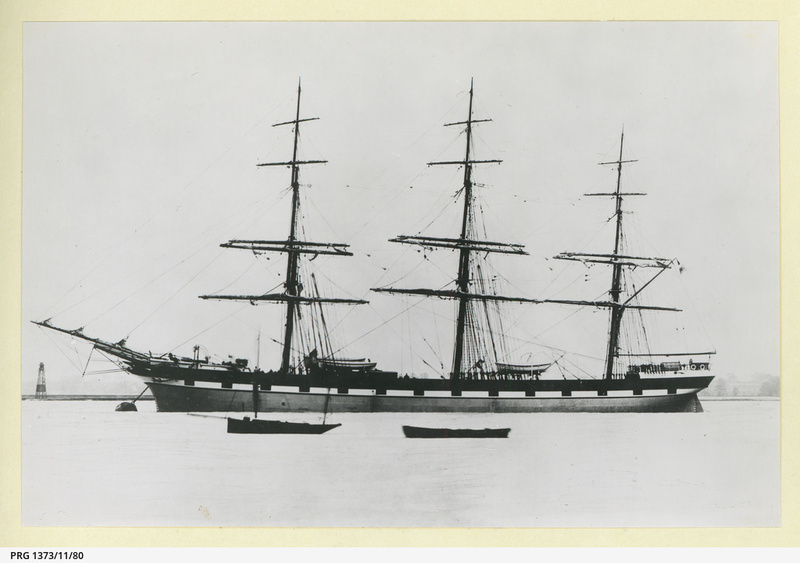 This image is from the A.D. Edwardes Collection of about 8,000 photographs, mostly of sailing ships from around the world, taken between about 1865 and 1920. Mounted in 91 albums, the photographs are arranged by country of ownership, with some special volumes such as 'Shipping at Port Adelaide' and 'South Australian outports'. Additional information, giving the history of the ships where known, has been provided by maritime historian, Ron Parsons.